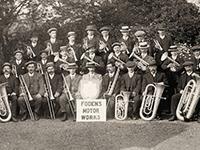 Foden's Brass Band is based in Cheshire, UK and is currently ranked as one of the finest brass bands in the world. The band has won many awards over it's 100 year plus history including the National Brass Band Championships of Great Britain 12 times and the British Open Championships 11 times. The band are world renowned for playing of the higest quality and perform regularly for audiences across the UK and world wide. Foden's were privileged to have been involved in the Brass Pass 'Young Brass Award Final' held on Sunday 31st March at the Stoller Hall, Manchester which was broadcast live across the World.